Critics of the listing of treasury looters got some knocks yesterday. They are wrong, said some stakeholders at the Second Forum of the Anti-Corruption Situation Room, organised by the Human and Environmental Development Agenda (HEDA). Activist-lawyer Femi Falana (SAN) said there was nothing wrong with the listing of looters by the Federal Government, contrary to the claim by the opposition Peoples Democratic Party (PDP) and some of its leaders. PDP National Chairman Uche Secondus and another top member, Dr. Raymond Dokpesi, have sued Minisster of Information Lai Mohammed and others over the inclusion of their names on the list. He said a court ordered the government to publish the names of those who looted the nation’s resources and the list was released in accordance with the court’s directive and in public interest. 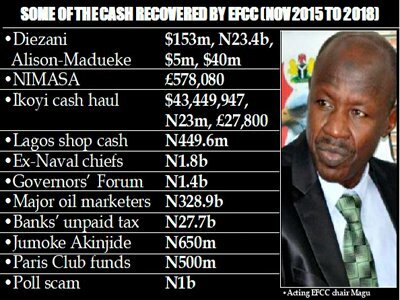 On Tuesday, at the inauguration of the new headquarters of the Economic and Financial Crimes Commission (EFCC), acting Chairman Ibrahim Magu said the agency had recovered over N500 billion since Nivember 2015 when he was appointed. Some of the people from whose hands assets and cash were recovered are on the looters lists released in two instalments b y the federal government. Falana said if the police could parade common men for petty crimes, treasury looters should be named. He said: “Recently, the names of looters were published in the newspapers and I read a lot of publications in the media. Media men and women were challenging the violation of the rights of the looters. They are saying how can you do that? How can you publish the names of looters? You have violated their rights to fair hearing. I say ‘wow, beautiful’, but please we must not join such hallelujah people. “Please, let us begin to interrogate the literature of corruption. In this country, common people are paraded daily for committing petty offences by the Police and the media men and women attend such media parade. They even interrogate the suspects, particularly armed robbery and kidnapping suspects. “With blood gushing out of their faces, the police will tell you that they have made confessional statements. The media would then ask, why did you rob? Somebody who has not been taken to any court, you force them to make incriminating statements regularly in our country. Nobody talks about human rights. Nobody talks about the presumption of innocence. “It is only when you are talking of the rich that we are sounding so eloquent and singing about human rights. Human rights are for all of us. “So please, let us stop the practice of talking about police brutality when a senator is involved because the police brutalise Nigerians daily. Falana also said the resuscitation of the Special Presidential Investigation Panel for the Recovery of Public Property (SPIPRPP) as legal. He asked the federal lawmakeers seeking the disbandment of the panel to go to court. He added: “Let me talk about the law establishing the panel; those who are opposed to the law are advised to go to court to challenge its constitutional validity. You cannot sit down in Parliament and say the law is illegal. Only a court of law can do that. "You can amend the law, you can even repeal the law, but you cannot sit down and say this law is illegal. When you do that, you are entertaining yourself jurisprudentially. “Let me tell you why they are criticising it. I have been fighting the anti-graft agencies since 2003, why this law is not being used and I am happy now that they have stumbled on the law. “The maximum punishment under that law is life imprisonment. If you fail to declare more than N1million, you go for life imprisonment under that law. To Falana, The Nation reports, the panel is necessary because the Code of Conduct Bureau and the Independent Corrupt Practices and Other Related Offences Commission have been castrated. He said: “The Code of Conduct Bureau has been castrated. ICPC has been castrated; the EFCC is managing. The Chairman of the Special Presidential Investigation Panel for the Recovery of Public Property, Mr. Okoi Obono-Obla, who was represented by his Special Assistant, Eugene Efere, said more than N4billion had been recovered. “This panel was first mandated to do discreet investigation on all Politically Exposed Persons (PEPs), devoid of media conviction. The panel does not announce those to be investigated. “We do a thorough job and until we get to the court for interim and final forfeiture, we do not make any disclosure. “The panel has recovered N1billion and $800,000 in NEXIM and more than N3billion in some other quarters. The Coordinator of HEDA, Comrade Olanrewaju Suraj, said: “As we go into 2019 polls, it is very crucial to engage leaders in accountability.